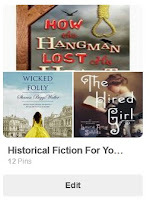 Anyway, recalling my days reading fictionalized accounts of long dead kings and queens, as well as stacks of stories of young early nineteenth century women marrying wealthy aristocrats, and those long, long multi-generational stories that cover a century...or two...inspired me to create a Pinterest board on my favorite childlit historical fiction covered here at Original Content. ...I tend to use Pinterest for... um... character collections. Faces from the internet who might look like the people in my books. Sometimes, weirdly, it helps to look at them. My Friday Fiction group kept pictures on there, when the site first emerged, to give us story prompts. Other than that, I hardly ever GO on Pinterest, so it's good to see it as a more useful thing! I wanted to try a form of social media marketing that was image heavy instead of word heavy, on the theory that there are people who prefer that. I could reach them. Also, I wanted to be able to repurpose material from Original Content. I've got a lot of it. So I am doing both those things with Pinterest, but I can't say I think it's doing me much good as far as marketing is concerned. But boards are easy to make, and I keep getting more ideas for them.